(New York, NY) — Yesterday the White House announced travel and immigration restrictions on eight nations: Chad, Iran, Libya, North Korea, Somalia, Syria, Venezuela and Yemen. This new policy is framed as a replacement and extension of the travel ban targeting six Muslim countries that has become better known as the Muslim Ban. Let us be clear- adding additional countries to the list does not diminish or alter the original intent of the ban in targeting Muslims and refugees. This latest iteration is simply another attempt by President Trump to deliver on his campaign promise to prevent Muslims from entering the country. It is yet another attempt to use fear to bypass our country’s laws and systems to further his own political agenda. This latest travel ban is against the American interest. Contrary to the fear that the President is trying to stoke, immigrants, refugees, Muslims, and communities of color contribute to our safety, strength, and the rich fabric of our national community. Muslim Americans proudly serve in the armed forces, 10 percent of America’s medical doctors are Muslim, immigrants are twice as likely to start new businesses and create jobs, and the Department of Health and Human Services found that refugees contributed nearly $270 billion in government revenues between 2005 and 2014. We are calling on our congressional leaders and senators to immediately pressure the President to end his travel ban, which we believe violates our Constitution and American values. Our federal courts have spoken clearly by outlawing previous bans, ruling that such travel bans violate the spirit of the law and our Constitution. 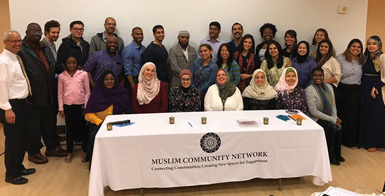 About Muslim Community Network: Muslim Community Network develops the leadership skills of all Americans to fully participate in the social landscape. For more information, visit http://www.MCNNY.org.